A shell is the interface between us and the kernel.And in this tutorial we are going to learn shell scripting . First we start with the basic commands.And this tutorial is the basic tutorial , soon we will cover the advanced shell scripting . And the operating system we use is " Kali-Linux". Now go through with it and practise as much as you can . To see the calender in linux we use the cal command . As you enter the cal command , it will show you the current month calender. Now if you are interested to view the 2013 calender , then enter the commands as shown below. Using touch command you can create the empty files in linux . Also you can create more than 1 files together . These are the empty files but you can also put text inside it using different text editors like vim , nano etc . Example : See the below image i have created 3 empty files together using touch command . To create directory , we have to use the mkdir command . To change directory you can simply use the 'cd' command . Then enter the text . To view files you have to use ' < ' (less than ) sign as shown in the below example . Here hackingDNA is the filename . Merge files means joining two files together and put it into one single file . Then we put these two files into 1 single file i.e merge. And at the last we view the merge file using 'cat < merge' command . To rename file mv command is used . In this example , i use " ln -s " to create a soft link .And also i link mukund to the mukund_soft . When we use the ls command , you will observe the color of the soft link file , it's different from others. 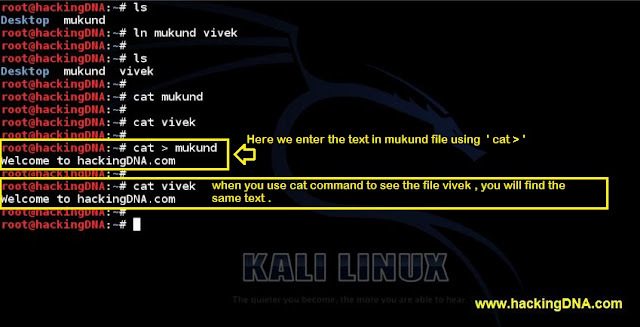 So now when i remove the mukund file and then try to access the mukund_soft file , you will observe you cannot see that file because you have deleted the hardlink (i.e mukund ). USING OF " ls "
Giving numeric permission is the easiest method . Numeric permission : 4 is for Read , 2 is for write and 1 is for execute . So for example : If you want to give rwx permission to group , users and other , you have to enter the numeric value 777 as shown in the below image . To see the version of kernel , name of machine , OS etc . SOON PART -2 will be upload ed, till then practise these commands and bring some perfection in your command line . That help you a lot in many situation . What if you combine all these commands in one shell script to automate some work?